The much hyped I-League football derby between East Bengal and Mohun Bagan at Kanchenjunga Stadium here ended in a goalless draw with both teams goalkeepers returning heroes. On a day none of their ace marksmen failed to fire a goal, East Bengal's TP Rehenesh was adjudged man-of-the-match with his resolute display under the bar in the first-half. Mohun Bagan's Debjit Majumder stole the show in the last period with an equally dazzling display as in the end the crowd returned dejected without witnessing a goal from high-profile derby. Mohun Bagan's star Haitian forward Sony Norde, who was instrumental in their I-League triumph looked threatening in the first-half, but East Bengal gaffer Trevor Morgan did well to keep him at bay with their right back doing a fine job. The Haitian was kept absolutely quiet as Morgan employed at least two men to hold him off to settle for a point and remained on top with 20 points from eight matches. The result meant Mohun Bagan remained at second place with 17 points from seven matches. There was very little to choose between both the teams as Mohun Bagan coach Sanjoy Sen finally replaced Norde in the 86th minute. Playing in front of a boisterous home support, East Bengal were kept on toes with the likes of Norde and Darryl Duffy threatening their defence more than once in the first 45 minutes. But it was the East Bengal goalkeeper Rehenesh who was the star of the first-half thwarting at least a couple of fine chances. The scenarios turned in the last 45 minutes with East Bengal on the ascent and it was time for Mohun Bagan goalkeeper Majumder to sparkle under the bar. In the 57th minute, Robin Singh headed on a long ball as Eduardo Ferreira could not clear the ball with Willis Plaza taking a fine possession from a close range but Majumder displayed some fine reflexes to help his team remain unscathed. Majumder made a second fine save in the 84th minute from a through ball. With 15 minutes left, both teams opted to play safe as the pace declined. While Mohun Bagan kept on piling the pressure, East Bengal received one half-chance in a 23rd minute move when Plaza strayed away from a Singh pass from the right flank. The Trinidadian however had a poor finish as his angled shot was not only weak but aimed straight at Majumder. Barring the solitary chance, the Mariners forward line kept on attacking and tempers were seen flying high at the stroke of half-time resulting in a yellow card for Ralte. 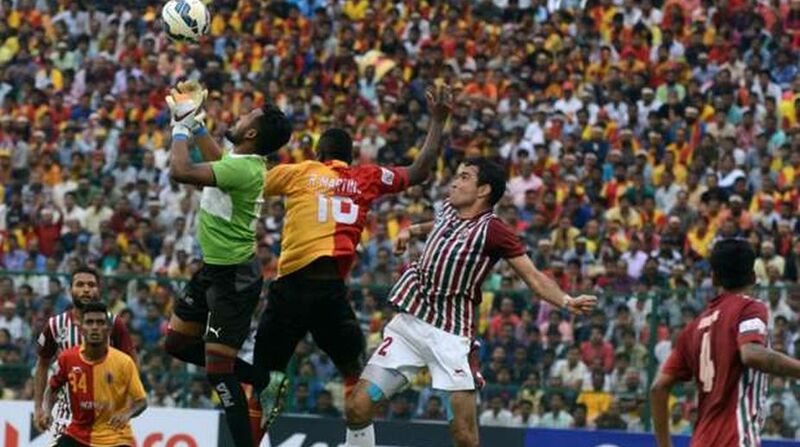 The East Bengal captain looked frustrated and pushed Duffy that instigated a scuffle moments after Mohun Bagan wasted another opportunity to draw first blood with Souvik Chakraborty missing in front of a goal. Duffy was seen running into East Bengal goalkeeper Rehenesh, something that did not go well with Lalrindika Ralte who pushed the Scot and both the teams joined in the scuffle before an alert referee took control of the situation. In the 34th minute, Norde's corner almost went straight into the goal but Rehenesh showed brilliant reflexes by palming it away. Earlier the East Bengal custodian showed his brilliance in the 14th minute when Mohun Bagan had the first shot on the target from a Katsumi corner. Norde retrieved it from the left getting past two East Bengal defenders but his low-cross to Kotal whose strike was easily held on by Rehenesh. Having served a one-match suspension, old warhorse Hossain returned for his 54th derby appearance in the only change to the red-and-gold camp, while Mohun Bagan rung in four changes to the team that defeated Colombo FC in the AFC Cup.